The Internet has done for many older forms of exchanging information – physical newspapers and magazine curculations are a shadow of their former selves. Much of this is Schumpeter’s Gale at work. it simply makes it easier to share information and ideas by disntermediating. The publishers and gatekeepers of the old world are rendered redundant. This isn’t an unalloyed win – they performed a role in screening out the rubbish, and this role has now moved to the search engines to try and make sense of the multimedia firehose pointed at your face. People moaned that printed publications tended to favour articles that promoted their advertisers’ products. I’m not quite sure that Google adsense is necessarily a step up from that, but being able to share audio, video, images and writing all in the space of a generation is great. and Google was indeed my friend, it’s possible that Paul was already behind the times. The British Sound Recording Association closed its doors in a meeting in Oxford, to be ratified in November 2014. NPR has a short radio piece with a few snippets culled from the BSRA’s last meeting in Oxford in June 2014. On the face of it it this seems bizarre – in a world full of podcasters and with sound being used more and more for non-music uses it puzzles me how and where the BSRA failed to move forward. I was never a member because I didn’t see what I could learn from it, and I am not a competition guy – I have never been, either in the fields of sound recording or photography, despite the fact than I manage to take pictures and field recordings that people license. I don’t decry competitions or competing – I simply don’t understand. This May the BSRA voted by a significant margin of 17 to 9 to wind itself up and cease operations in November. Dropout called out the problem, in his valedictory column in the last issue of Tape Recorder magazine [ref]Tape Recorder, April 1970 page 173; you can find back issues in PDF at http://www.americanradiohistory.com/ – look for Studio Sound in Audio and Recording[/ref] issue before it became Studio Sound. Recording begins, oddly enough, with a microphone ; and what your amateur recordist lacks is access to signals which are worth recording, if his interest be confined to music. of discs? I’ll bet it’s very few ; I know it is with me. But then, I long ago abandoned that fantasy, and began to derive my reproduced music from the radio and the gramophone. I use my recorders—three mains’ machines and a battery-portable—for other things; and when I say use, I mean use. But, with reluctance, I have come to the conclusion that most amateur recordists have no interests with which tape can help them or—which is more likely—they have not the imagination to see what those interests might be. I was a child when he wrote that and never read it, but there was something magical about going out with a EL3302 cassette recorder and bringing some of the birds back in with me from the garden. The sparrows have now left my parents’ garden in London, indeed for reasons unknown they have left the city en masse. It would have been nice to have had some of those old C60s with London sparrow sounds from the 1970s. Not particularly because they would have sounded that different, probably, but as a memento of flocks long gone. The Internet has fostered a new breed of sound hunters – and phonography, sound art and field recordists are well represented. It’s not clear to me how the BSRA lost its mojo, but I admire them for having the honesty to recognise it. I do wonder if the contest mindset is perhaps an anachronism in today’s environment – the whole open-source and mashup culture of, say, freesound is a world apart from the highly structured approach of the British Amateur Recording Contest. I wouldn’t know where to start with the latter. I went to university at Imperial College, in the chi-chi London district of South Kensington. The area has much to offer the field recordist in terms of resonant public spaces. If you want to avoid the rain or simply enjoy the soundscape you can take the long pedestrian tunnel under Exhibition Road from the tube station to the museums. Footfall Foley wizards will hear the tapping aren’t high heels which most people would associate with the percussive sound but Blakeys on a man’s shoes. South Kensington has three lovely Victorian museums. Massive galleried spaces over several floors and often a curved vaulting ceiling. These are just made for binaural stereo! 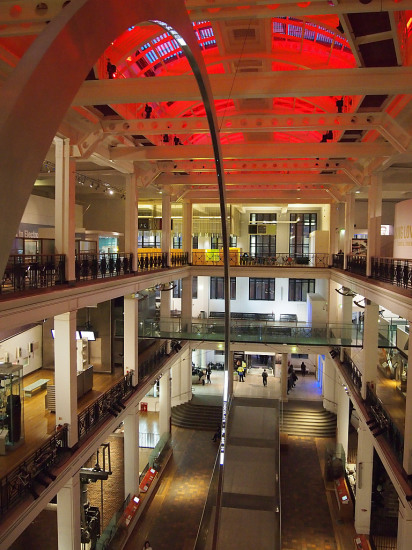 I went to the Science Museum in Exhibition Road, part of a cluster of Victorian Museum buildings. The others are the Victoria and Albert and the Natural History Museum. The latter has an amazing curved atrium and a fine acoustic space. the sharp snap at 00:32 is an art exhibit marked do not touch, which of course everyone touches, resulting in a spark and a slight shock to the curious. I enjoyed the visit and the incidental soundscapes. It is also good that Britain ended its dalliance with charging for museum entry.